The Digital Research Library of Illinois History Journal™: The Neway Auto Wash Bowl, Chicago, Illinois. 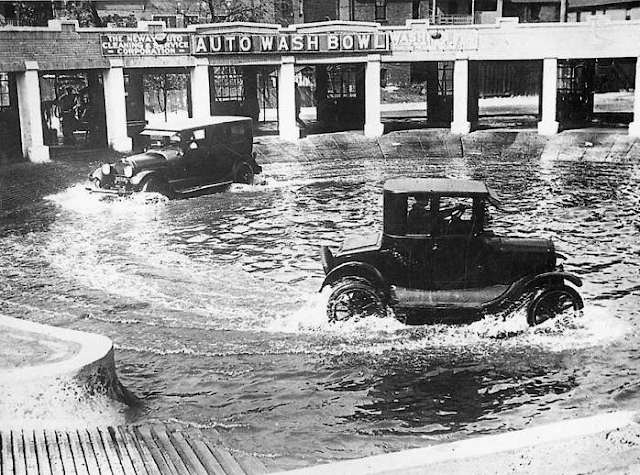 In the early 1920s the Neway Auto Wash Bowl was built at 300-310 South Federal Street in Chicago by The New Way Auto Cleaning & Service Corp. The car was first driven around this pool of water to flush mud and dirt off of the undercarriage. It was then driven up into one of the stalls and the car was washed in the normal manner to complete the job.